Orange Shirt Day occurs annually on Sept 30th and recognizes the harms done to our Indigenous communities, friends and family by the Residential School System. 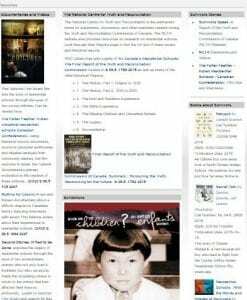 Prepared by Library staff member Joan Boersma the Residential Schools Guide places many “residential schools” resources at your fingertips. In the guide you will find books about survivors, documentaries and videos, eBooks, survivors stories and links to resources such as the National Centre for Truth and Reconciliation where the “Final Report of the Truth and Reconciliation Commission” may be viewed. Red River College Library has recognized Orange Shirt Day with a window display outside the Notre Dame Campus Library. We have also placed a selection of books in the display. Come by and see what is available, or view a complete list of all books in our display. If you see something you like, inquire at the Circulation Desk inside the library.